Sometimes I find myself in a rambling mood. Do you? I just have to get out from in-between the four walls and wander around a little bit; see something new. That’s how I felt on Saturday. In search of a cure, I grabbed my camera, got in my big Ford and started driving. 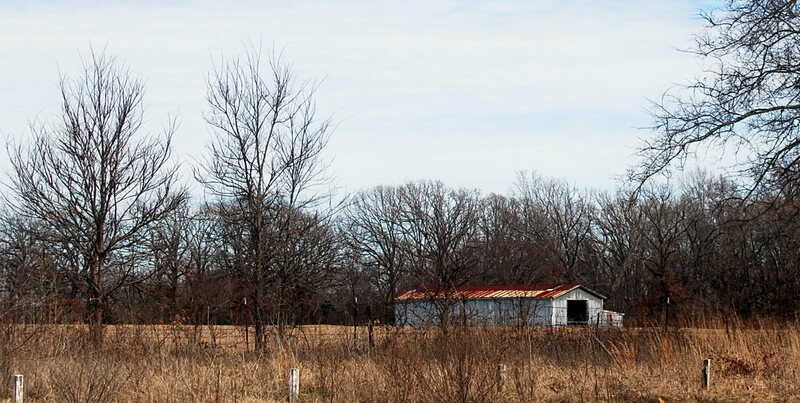 I headed out Highway 69 toward Greenville, Texas, just looking around and listening to music. 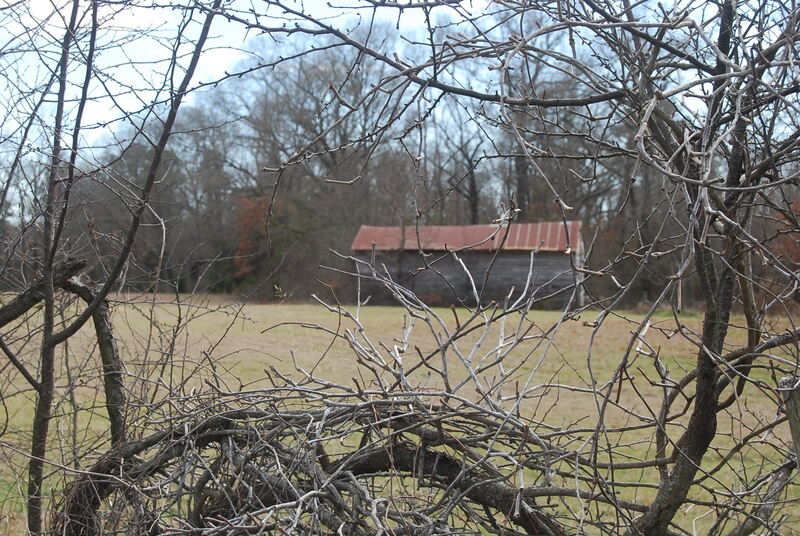 Then, I started noticing the old agricultural structures in the area. 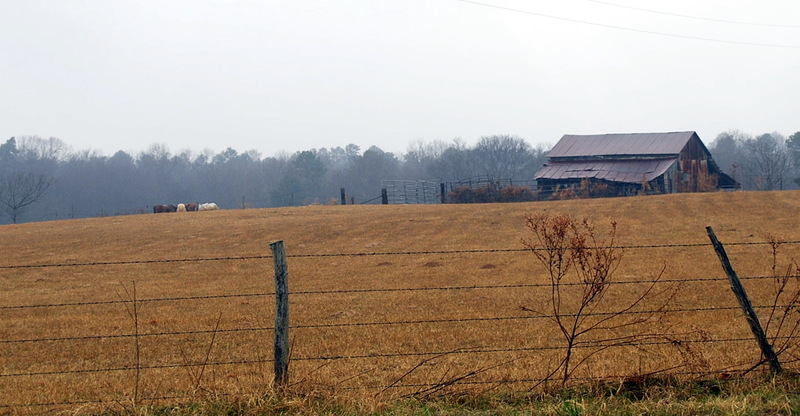 When I see one of those old barns, with their rusty tin roofs and gray, weather-beaten boards, it takes me back to my childhood. When my family would pile in the station wagon in the ’70s and ‘8os to head up from Florida to the Carolinas to visit family, I’d notice lots of those rust- and gray-colored buildings. I loved the look of them. I was used to the big city of Charlotte, N.C., and our new town, St. Joe Beach, Florida; not exactly agricultural areas. We’d make that long commute from northwest Florida up to McColl, S.C., where my dad’s parents lived, (a town in Marlboro County that encompasses only 1.1 square miles of land!) and those old structures would always catch my eye during the drive. I felt nostalgic about them, even then. I would imagine what the barn might have looked like when the farmer and perhaps his neighbors built it many years before I was born, and how proud he probably had been of it. I imagined his children running in and out of the barn, climbing on hay bales and doing chores. Now, the barn is old, and so are the people, if even still living. That is what speaks to me now. The moving along of life; how nothing stays the same, and how our appearance may change, but we still stand and do what we were created to do. They are rustic; they are not bright and shiny anymore, they are a little droopy with age, but they are useful, and seem wise, in a way. They are rather like older humans, when you think about it. Anyway, after I took pictures and sang at the top of my lungs and had a little fun, I went back home to make a big pot of soup. This time, pasta e fagiole. I do love soup, as I’ve said in previous posts. It’s such a comfort food to me, and I needed some comfort. 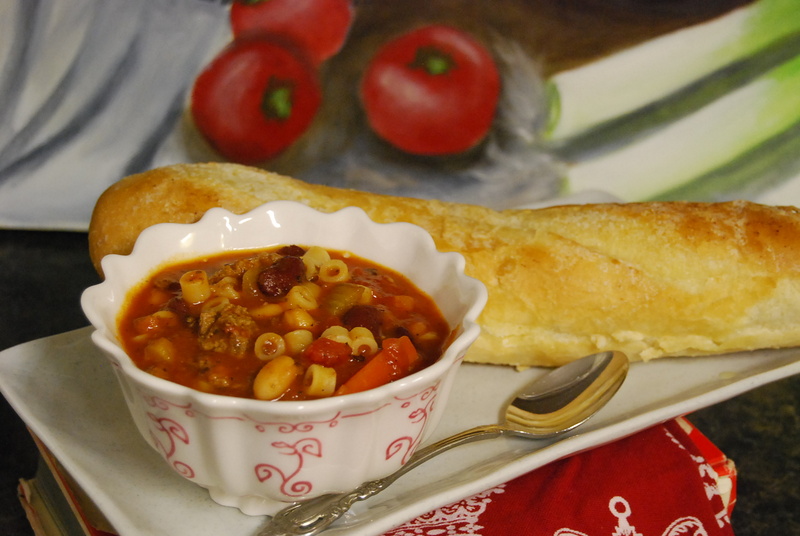 Pasta e fagiole (literally, pasta and beans) is so hearty, and is almost like what Rachael Ray would call a “stoup,” a combination of a stew and a soup. In the old days, pasta e fagiole didn’t contain meat; it was invented by Italian peasants who didn’t have any meat to eat. However, now we nearly always find meat in this soup. To me it was the perfect way to end my Saturday; chopping and julienning vegetables, browning ground beef, seasoning things to what I hoped was perfection. Creating. It turned out really well. This recipe that I use I found about five years ago on a website called TopSecretRecipes.com. Let me share it with you here; it’s a good copy of the Olive Garden version, though I actually like this a little better because you can add or take away things to suit your own tastes. For example, this week I thought it tasted a bit too acidic when I taste-tested it, so I added a couple of teaspoons of sugar to balance that out. 1. Brown ground beef in a soup or stock pot, then drain most of the fat. 2. Add in chopped, minced & julienned vegetables, and saute. (I had to add 1 TBS olive oil to the pot first, as my ground beef didn’t release much fat to saute in.) Saute for ten minutes, stirring occasionally. 3. Add all other ingredients, except pasta, and simmer, stirring occasionally, for an hour. 4. About 50 minutes into the simmering, boil the pasta according to package directions. 5. Rinse pasta after cooking; add to the pot of soup. Tips: Rinsing the pasta will help keep it from absorbing so much of your broth. Do not use more pasta than the recipe calls for, or it will definitely soak up ALL of your broth! 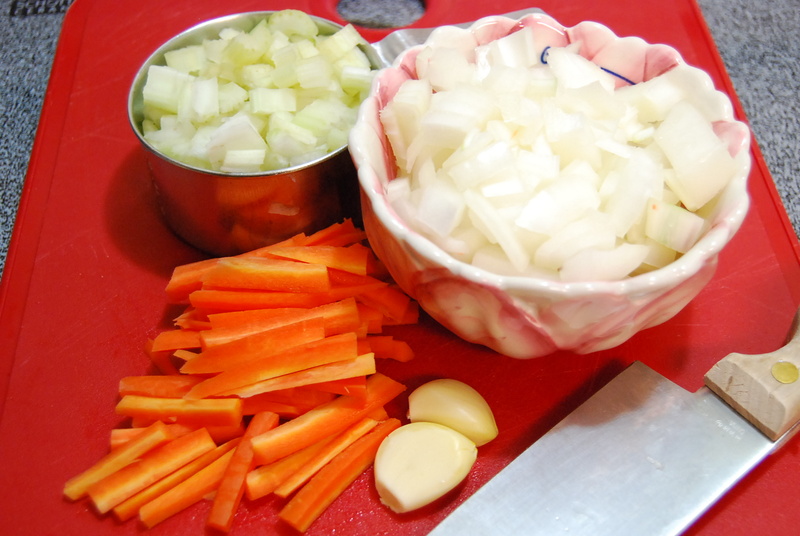 If pasta does absorb broth, you may loosen the soup with chicken broth, water, or more V-8 juice. If you do this, re-taste for proper seasoning balance. If soup tastes too acidic, add some sugar, 1 tsp at a time. Stir in and taste for balance. I served mine with nice, crusty baguettes (I like them better than Italian breadsticks) from the bakery, spread with garlic butter. It was a delicious, warm, home-y meal. It was the perfect ending to a day spent wandering the countryside, recollecting myself, and being nourished. Thanks for your words…I felt like I was there with you on your family trip. You, my friend, are a modern day Philosopher!!! The pictures are wonderful as well. Love to use some like these on the air sometime…share them with everyone. Have a wonderful day. You just changed our dinner menu for tonight. Going to put this in the slow cooker at lunch. Thanks, Stephanie. I love the barn pictures … East Texas has such a wonderful collection of them around …Thanks for sharing ! Your Wood county neighbor ! Hi Darlene! Thanks for the visit; I’m glad you like the pictures! 🙂 I love the old barns, for sure, and hope to get out and wander around a little again this weekend. Maybe I’ll find some more if I head up towards Winnsboro. As usual, dear MamaStephf, I am inspired by the beauty of your post – beautiful words, beautiful photography, beautiful food. Many thanks! I’m so glad you liked it, Kerri. 🙂 We all need a day like that sometimes, just to get away. Great copycat recipe! I just made this tonight and it came out fantastic. I absolutely love this soup. I will be making this often during the cold winter months. Two thumbs up! So glad you enjoyed it, Jill! I love it a lot and make it all winter, too. 🙂 Thank you for the comment!